Most people have heard of the term called “Pegasus” or “Unicorn” in the startup world to describe a mythical startup valuation of $10B+ or $1B+. There is another mythical creature called the “Centaur” with valuations of $100M+ and the “Pony” with valuations of $10M+. Although the Pegasus and Unicorn are getting all the recognition, Centaur’s and Pony’s may have all the glory for 2016. There is a new startup landscape on the horizon. To be a true Unicorn, the companies will be raising capital from investors that will want justification for these current or future valuations. This means typical Wall St. models will be used for earnings, sales, or growth metrics to show investors the justification of the valuation. Particular analysis of the most recent 4 quarters and next quarter will be looked at closely. Instead of throwing money at marketing for user acquisition, costs will be analyzed under a microscope. 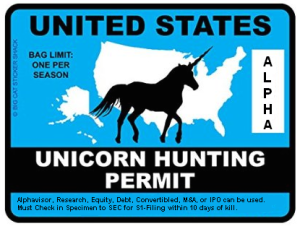 Unicorn slaying will be common for these Unicorns that are unable to sustain rapid growth of sales, earnings, or metrics. Any blips in these quarters can grind the Unicorn into a Unicorn burger. The risk of high valuation for a Unicorn gets a little ugly when there is limited liquidity. The SEC is also looking into startup valuation procedures. As Mark Cuban noted “The only thing worse than a market with collapsing valuations is a market with no valuations and no liquidity.” Let’s face it, private equity is a different animal than public companies listed on an exchange. Changing valuations is a risk that all participants will have to deal with. Because Unicorns are more mature start-up companies, liquidity for owners of the company drops when valuations stay the same or drop. This is very important because the next round of financing needs a higher valuation in order to make current and potential new investors smile. These valuations are derived from the prospect of earnings, sales, or growth metrics. Because of the new strict criteria, investors will be looking at Unicorns or alternatives that have a solid business model, outstanding growth potential, and experienced leadership. Some of these alternative businesses may be Centaurs and Pony’s for investors to pursue and catch. 2016 will be quite interesting because we will see a rise of institutional investors going into early stage companies in search of Pony’s or Centaurs in hopes of finding a Unicorn. Some of these Unicorns will transform into the most sought after creatures, the Pegasus.